On Friday, May 15th, Rory Fanning came to the end of his journey – Ocean Beach. 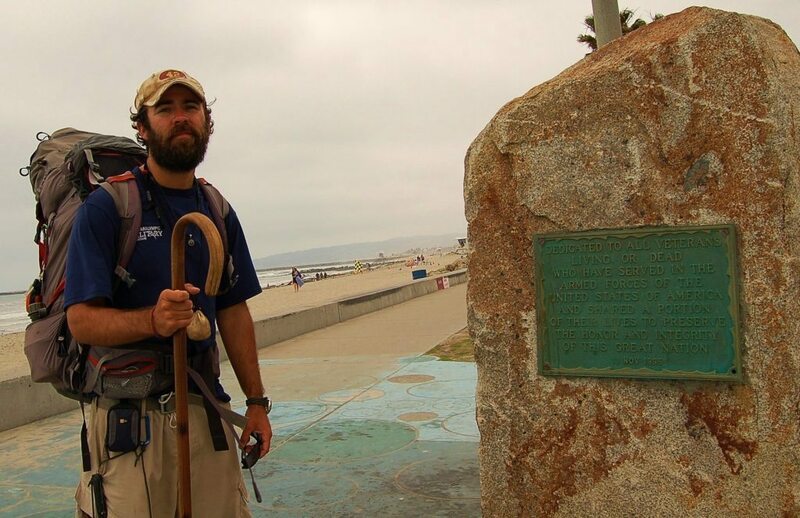 He had just finished his 8 month, 2700 mile walk across the USA in memory of his friend Pat Tillman. He had started in Virginia Beach, Virginia, on September 17, 2008. Fanning had been a US Army Ranger with Tillman. Now he finished his journey to raise money for a foundation in his friend’s name. He raised $35,000. Pat Tillman, you may remember, was a famous pro-football star, who was killed by “friendly fire” while serving in the military in Afghanistan. But the Army, the Pentagon, the generals – including the one being appointed right now to be the commanding general in Afghanistan – all covered up the fact that he was killed by his own soldiers. It was early on in the wars, and the military didn’t want such negative news. There were even credible allegations that Tillman was assassinated. Tillman’s mother wrote a book how her son was used for public consumption. At any rate, Rory Fanning wants to keep the memory of Pat Tillman alive. Local photographer Jim Grant met Fanning down at Veterans Park at the foot of Newport Avenue. Anyone who passes up the money and limelight of the NFL to go fight terrorists in Afghanistan is by definition a true American hero. I am very concerned over the path taken by Obama in Afghanistan. Steve – I was rushing to get that post up. Thanks for the important info.